On April 4th, the US production version of the 2013 Subaru XV Crosstrek™ made its debut at the New York International Auto show. The XV Crosstrek™ is a right-sized crossover for all of life’s adventures. With its 8.7″ ground clearance, 17-inch all-season tires, and integrated roof rails, it looks like it’s ready for anything. And with its Symmetrical All-Wheel Drive, 33 MPG* hwy and SUBARU BOXER® engine, it is. The New York International Auto Show is open to the public from April 6-15. If you’re in the area, come by and see the XV Crosstrek™ on display at the Jacob Javits Convention Center. There are stories in every culture about a young man or woman who is supposed to marry someone sensible, attractive, a good cook and good provider. But when the protagonist of the story meets the would-be fiancee’s more interesting, vivacious, funny and unconventional sibling or best friend, sparks fly and the original relationship doesn’t stand a chance. 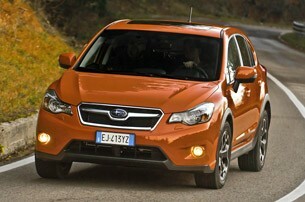 And so it was when we drove the 2013 Subaru XV through the roads and highways of Tuscany. On Day One, we drove the version the U.S. will get in the third quarter of next year. The first thing to hit us: déjà vu. This is the 2012 Impreza hatchback, albeit with cladding above the wheel wells and a a seriously jacked up stance. It will have the same, brand-new 2.0-liter flat-four as the Impreza hatch we tested a few months ago that is just hitting dealer lots. Despite the fact that the XV and Impreza hatch are as close to one another as the Olsen twins (if one of them were wearing platform shoes), Subaru will market the crossover as the XV Crosstrek. Indeed, parent company Fuji Heavy Industries would only give it to Subaru of America if they gave the car its own unique name (big decision coming about whether to capitalize the “T” in ‘trek’). The company previously sold an Impreza with a raised suspension called the Impreza Outback Sport, and nobody was happy with the sales results. As previously noted, the exterior is the same as the Impreza hatch, only raised 8.6 inches off the ground. Both cars sport a more chiseled, aggressive hood. 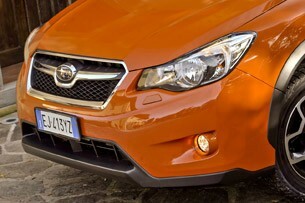 The grille on the XV has been tweaked to include a continuous chrome bar under the Subaru logo. 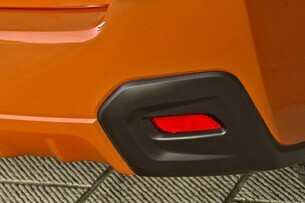 The black cladding topping the rear wheel wells continues down under the car and surrounds the rear fog lights. The huge gaps in the wheel wells are necessary for suspension travel while traipsing off road, though these cars are typically bought for their sure-footedness in snow and dirt, not creek beds and mountain crawls. The new Impreza is the same length and width as the old model, though the wheelbase has been lengthened by two inches giving rear-seat passengers extra comfort. We found gallons of front-seat headroom for us two five-foot, 10-inch occupants, not that the former Impreza was a slouch when it came to space up front. On the inside, it’s a clean, straightforward setup. No heavy-handed styling like in the Ford Focus center-stack. It’s a cabin designed for sense and sensibility, for people who put 20 percent down on their mortgages and don’t carry big credit card balances. There’s so-called soft-touch surfacing on the upper door panels and dashboard. The 2.0-liter flat-four (148 horsepower and 145 pound-feet of torque) is the only engine Subaru is copping to bringing Stateside. The U.S. isn’t even likely to get a turbo, to which we say, why the hell not? This crossover is supposed to be for urban adventurers, according to the marketing presentation, but alas turbo power will be reserved for the Impreza STI and WRX. The engine is mated to a six-speed CVT with paddle-shifters that Subaru calls “Lineartronic.” We dipped into manual mode in both the Impreza and XV, and still don’t quite get the point. It’s not horrible off the line in automatic, but we’d take a manual tray for both cars given the choice. Like the Impreza, the XV uses a MacPherson strut and lower L-arm front with a double-wishbone rear suspension. 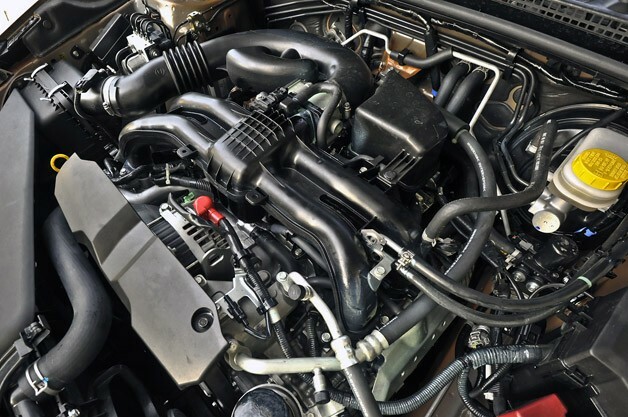 With the boxer engine and symmetrical AWD, the XV has a well-balanced and comfortable feel. As the weather called for flurries, Subaru had outfitted our tester with snow tires, but the wet stuff never materialized. Regardless, the electrically assisted steering’s on-center feel – even with the cold weather rubber – was light but communicative, and the engine’s start-stop system’s engagement was obvious, but just shy of refined. On the whole, there isn’t too much here that the Impreza hatch doesn’t already offer, except the higher ride height and the more aggressive pose that the boosted suspension provides. But those changes are important as light crossovers represent the fastest growing category in both the U.S. and Europe. 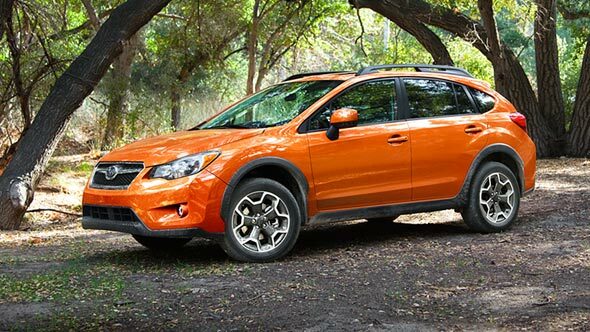 The XV Crosstrek not only qualifies as a crossover (the Impreza doesn’t), but it will start at under $20,000 – perhaps even under $19k – putting Subaru into a critical price bracket for shoppers comparing crossovers online (the standard 2012 Impreza clocks in at just under $18,000 in five-door form). If you like the Impreza hatchback and Subaru’s all-wheel-drive system, then there’s nothing not to like here. If the idea of a legit crossover – versus a hatchback – floats your boat, then Subaru is making sure you don’t feel the need to go to another brand. That’s just good business sense, even if it’s close to a rolling misnomer. Can it handle some off-roading? Sure. We drove the XV through a vineyard on a dirt road, but we’re sure a 1970 Dodge Coronet could have handled it without getting stuck. And that’s likely the most demanding conditions owners will throw at it. 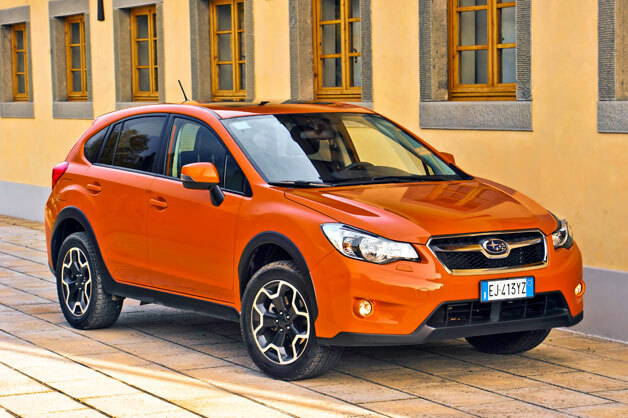 But the XV is a solid, all-wheel-drive utility knife with a smooth, satisfying ride – just like most Subarus. Subaru of America thinks it can sell between 25,000 and 35,000 XV Crosstreks a year – even without offering a turbo or a diesel. Why can’t we get the better hardware that Olivier, Sven and Klaus get? We hear that Subaru of America is selling everything Japan ships to the U.S. and that the Japanese honchos don’t see the need in sending over anything they aren’t sure about (diesel) or that drives the cost up (turbo). Maybe Subaru executives know something we don’t, but if the brand’s famously adventurous buyers got the chance to experience the diesel model’s superior drivability and economy for themselves, we have a feeling they’d find even more to love… and buy. To put it simply, the 2013 Subaru XV Crosstrek is an Impreza five-door with a raised suspension, specific front and rear fascias, body-side cladding and exclusive wheels. However, the company line is that the XV is not an Impreza but its own model targeting a new group of customers: urbanites. Traditionally, Subaru does well with active outdoor hobbyists with its lineup of crossovers, but none of the company’s models put an emphasis on targeting the city-slicker crowd until now. What’s Subaru’s plan of attack to appeal to Starbucks drinkers? Provide a sleek and sporty appearance, offer a fun driving character and flexible interior space. Drivetrain options, not surprisingly, mirror the Impreza’s with a 2.0-liter boxer four-cylinder producing 148 hp connected to a standard five-speed manual transmission or an available continuously variable transmission. Well, like a tall Impreza five-door hatchback. Unfortunately, the test vehicles we drove were European models shod with Yokohama winter tires. Our test drive took place in and around Florence, Italy, in December, where snow is usually the norm. But during our two days of driving, temps were in the high 50s with not a flake of snow in sight–not ideal conditions for full-fledged winter rubber. As expected, the car exhibited more lean than we would like in corners and gradual sweepers on the expressway, and steering response was numb, which no doubt had much to do with the tires. We fully expect things to be more composed with proper, stock all-season tires mounted. Ride quality was surprisingly stiff with larger bumps giving us a good jolt in the driver’s seat, but smaller ruts were smoothed out by the suspension without a hitch. Cabin isolation from road noise and wind noise was also good. 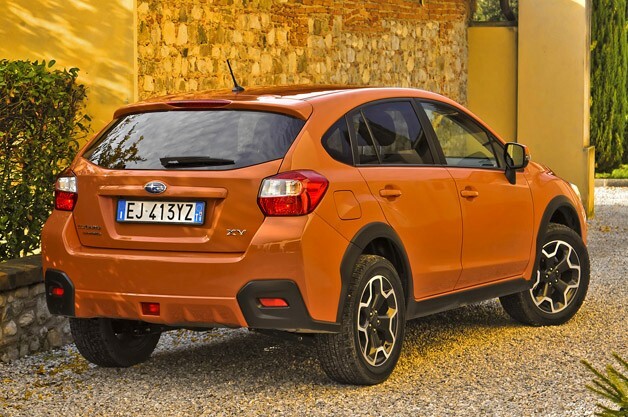 The first day had us in a six-speed-manual-equipped XV (which the Impreza and the XV get in Europe; U.S. models are saddled with a five-speed unit because of cost constraints), which helps get the most out of the flat four-cylinder. Power is adequate, but merging onto the expressway and getting past slower traffic requires a hearty stomp on the throttle. We also had the opportunity to pilot an XV with Subaru’s 2.0-liter turbocharged diesel boxer four-cylinder with 148 hp and 258 lb-ft of torque mated to a six-speed manual gearbox. With peak torque available from 1,600 rpm, it gives the XV more grunt than you’ll ever need for slicing through the urban jungle. Unfortunately, there are no plans in the immediate future to bring the diesel to the States in any Subaru vehicle. Being a Subaru with standard all-wheel drive, our route took us through some light off-road duty, which the XV handled without a hitch. If you value hatchback flexibility (22.5 cubic feet of cargo space behind the rear seats, which grows to 52.4 with the rear seats folded down), all-wheel-drive traction and hipper looks, then the XV is an enticing offering. 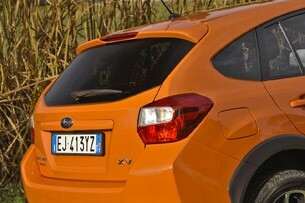 As we said, it’s a raised Impreza five-door, but the small touches designers used to turn it into the XV are slick. 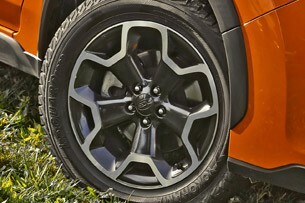 The 17-inch aluminum wheels with black-painted spoke insets stand out, and the car is available with an orange paint job to really make it pop. 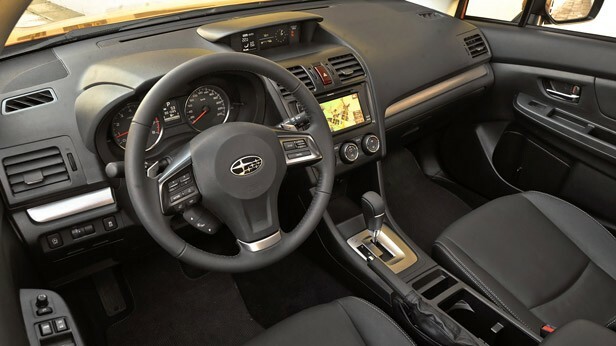 The cabin is exactly the same as the Impreza’s, which is a good thing as Subaru went to great lengths to up quality with soft-touch surfaces on all major touch points. There’s also a great view from the driver’s seat with the skinny A-pillars made possible by the use of high-strength steel. Numerous storage spots provide lots of space to stash items, and major controls are laid out in an intuitive manner. Then there is the fuel economy, which should be quite good when equipped with the CVT gearbox. EPA ratings aren’t available yet but should closely mirror those of the Impreza, which is rated at 27 mpg in the city and 36 mpg on the highway with the new Subaru 2.0-liter. And keep in mind that’s with all-wheel drive. 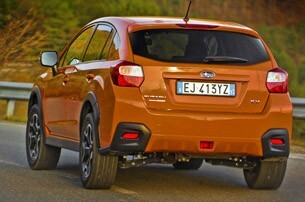 If you’re on the fence about the XV, you’ll have plenty of time to think about it: The car doesn’t arrive in the United States until next fall as a 2013 model. Initially, the U.S. Subaru arm didn’t want to bring the XV over at all, but after seeing the vehicle they had a change of heart and saw the potential to appeal to a new group of customers. Being diesel fans and having had a chance to sample Subaru’s latest oil-burner, we think Subaru should also reconsider bringing that engine to America.